A Prunus domestica L. cultivar. ‘Branches smooth, almost like the Green Gage. Fruit, except in colour, very like the Green Gage, middle-sized, roundish oval, somewhat flattened at the ends. Suture moderately depressed. Stalk about an inch long, rather thick. Skin violet, powdered with a light blue bloom, beneath which it is engrained with pale yellow dots. Flesh greenish amber, rich, sugary, and strikingly high flavoured. Stone oval, inclining to ovate, compressed. Ripe the end of August and beginning of September.’ [George Lindley – Orchard guide p.456/1831]. ‘Purple Gage is a European variety of unknown origin, though in the Catalogue descriptif des fruits adoptes par le Congres pomologique for 1887, it is said to have been raised by M. Galopin of Liege, Belgium. As it was not mentioned by Duhamel in his Traite des Arbres Fruitiers in 1768, it is thought to have been unknown at that date. English and American authors generally apply the name Purple Gage to this variety but in continental countries the name Reine Claude Violette is most common. 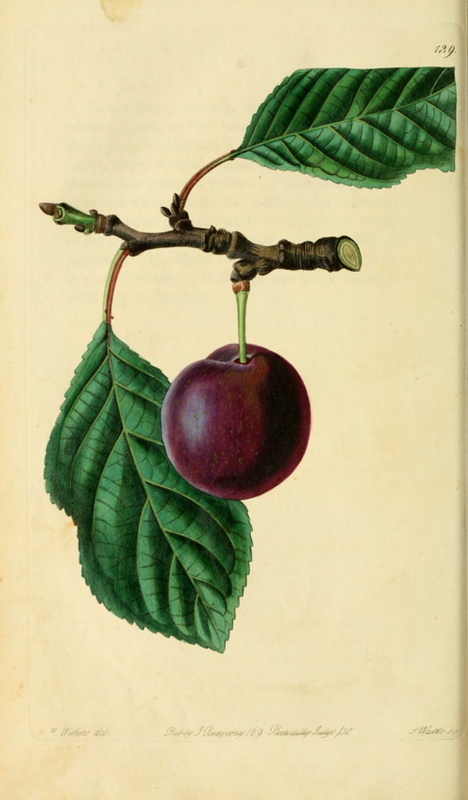 It was imported into America early in the last century and in 1852 was added to the recommended list of fruits in the American Pomological Society catalog.’ [Plums of New York p.318]. John Lindley, writing in the Pomological Magazine, doubts that ‘Purple Gage’ is truly synonymous with ‘Reine-Claude Violet’. ‘A blue Gage Plum has been long known and little esteemed in our Gardens: it is the Azure Hâtive of the French. As the Reine Claude is the Green Gage of the English, it might have been supposed that a Reine Claude Violette would have been the same as this Blue Gage. Such, however, is not the fact; the fruit now figured under the name of the Purple Gage being a variety of very high quality, fully equal to the Green Gage in all respects, and having this superiority, that while the latter is apt to crack in wet summers, and will never keep at all after having been gathered, this, on the contrary, will endure, if the climate be dry, through August and September, even till October, and is scarcely at all disposed to crack. The origin of the variety is unknown; it must, however, be recent, as it is not mentioned by Duhamel, or any of the older French writers, and is even omitted by Noisette in his Jardin Fruitier.’ [PM t.129/1830]. The figure is used as illustration here. Also figured in Le Jardin Fruitier du Muséum [JFM vol.4/1861] and Saint-Hilaire [pl.224/1830]. Listed in Addenda to the 1857 catalogue as ‘Purple gage’ [Plum no.13/1857].